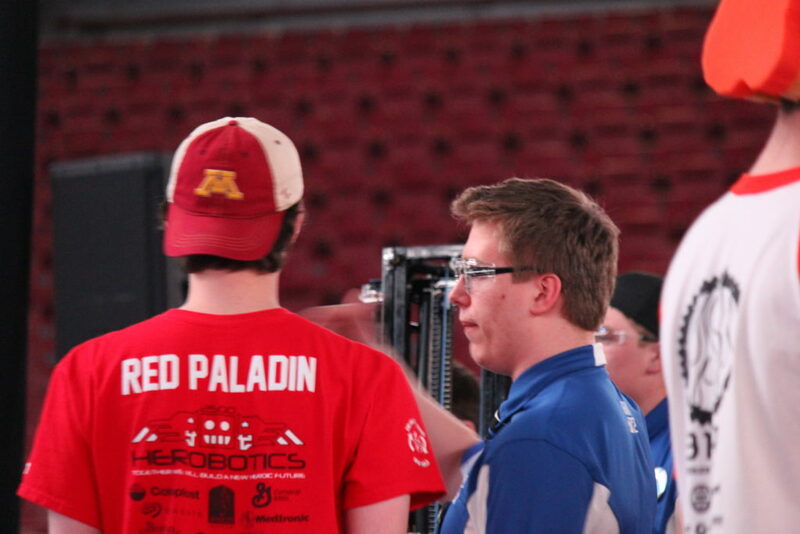 Our action-packed day started off at 7:45 when we arrived at the Williams Arena, ready to dominate the rest of our qualification matches before alliance selection. 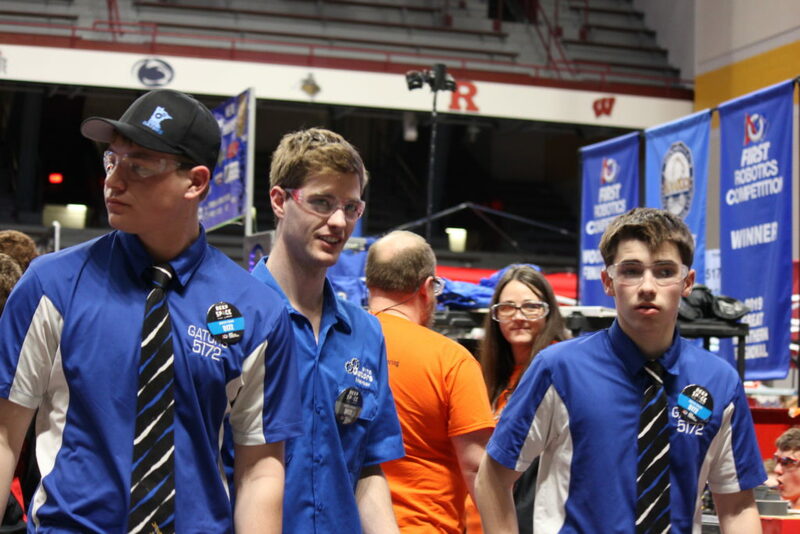 At the conclusion of yesterday’s qualification matches, we were ranked 3rd with only two matches left to compete in today. 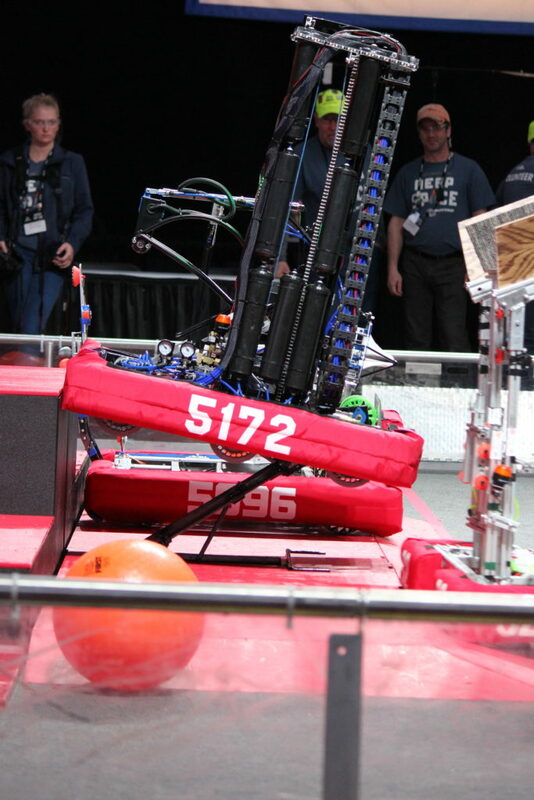 We won our first match of the day 76-51 and moved into the second place spot. 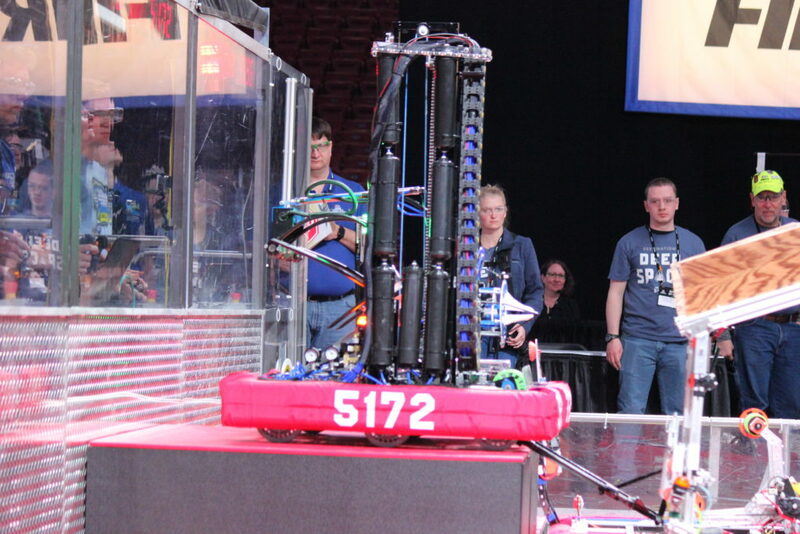 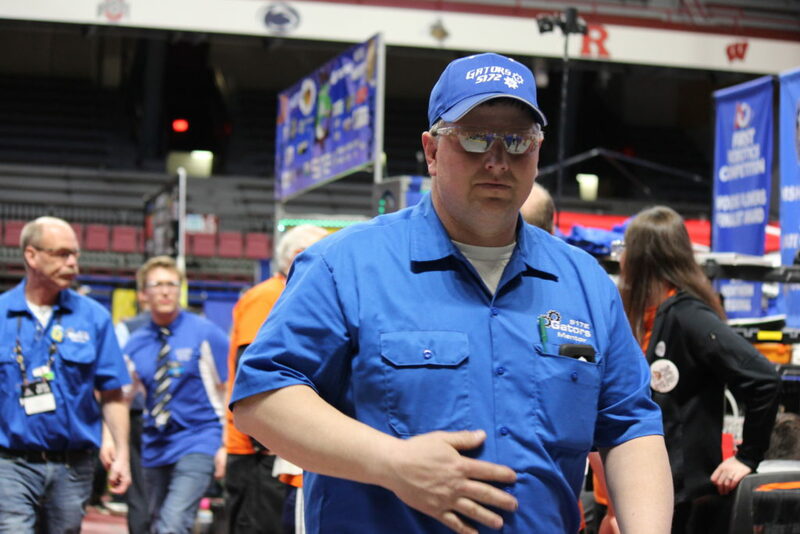 Our next match was looking to be more of a challenge as our alliance consisted of the 2nd, 3rd, and 60th ranked teams versus alliance of the 1st, 7th, and 8th ranked teams. 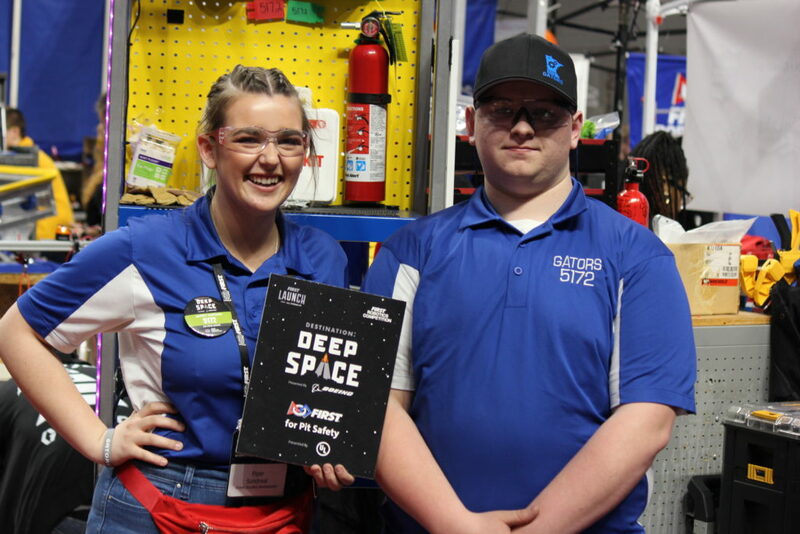 Though it was tough, our alliance emerged victorious from this grueling face-off and we had claimed the 1st place ranking spot! 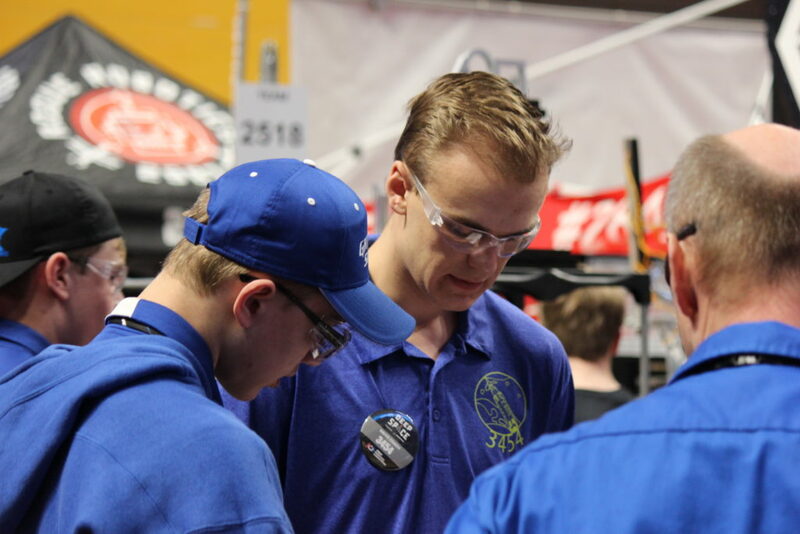 No one had passed us by the end of the qualification matches, so we remained ranked 1st and moved onto alliance selections. 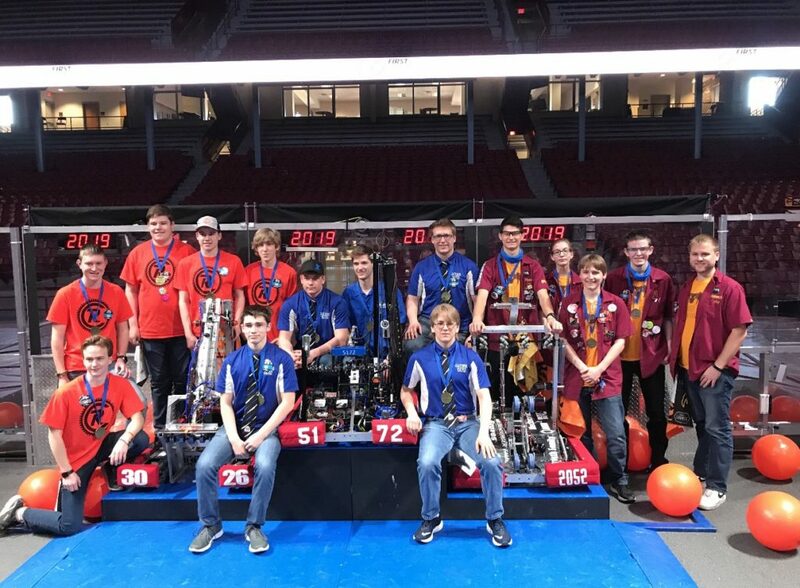 Joining our alliance were teams 2052 (Knight Krawlers) and 3026 (Orange Crush Robotics), and into the quarter-finals we went. 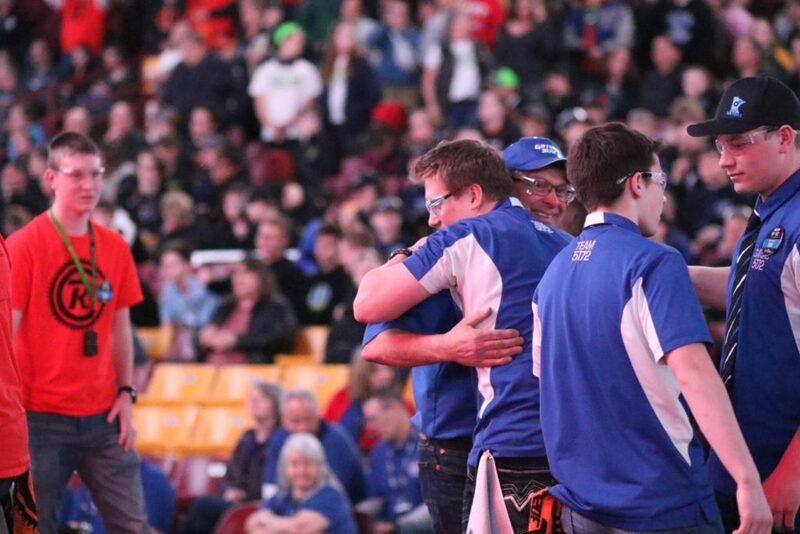 Our first matches were against the 8th ranked alliance (3007, 4207, 3244) and we ended up winning best of three with scores of 92-55 and 94-70, sending us into the semi-finals. 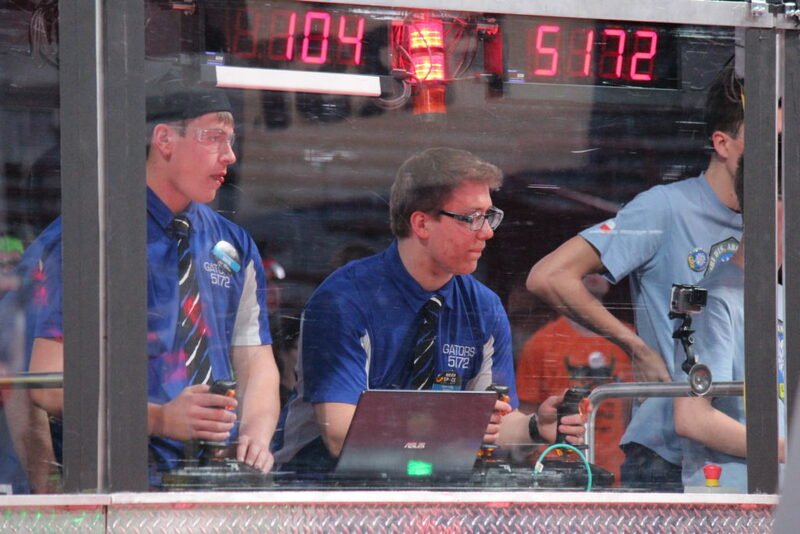 The 5th ranked alliance (2508, 2823, 3630) met us in the semi-finals and were defeated by our dynamite alliance with scores of 95-73 and 90-74. 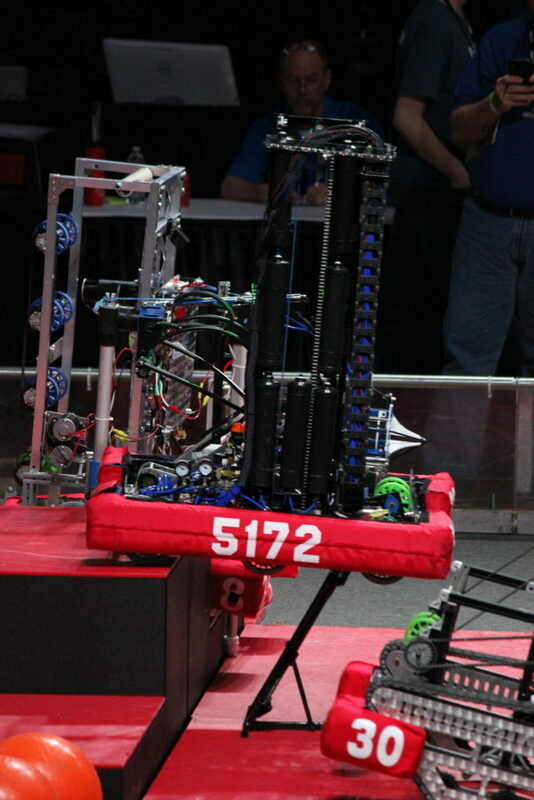 Two regionals in a row, we had made it to the finals. 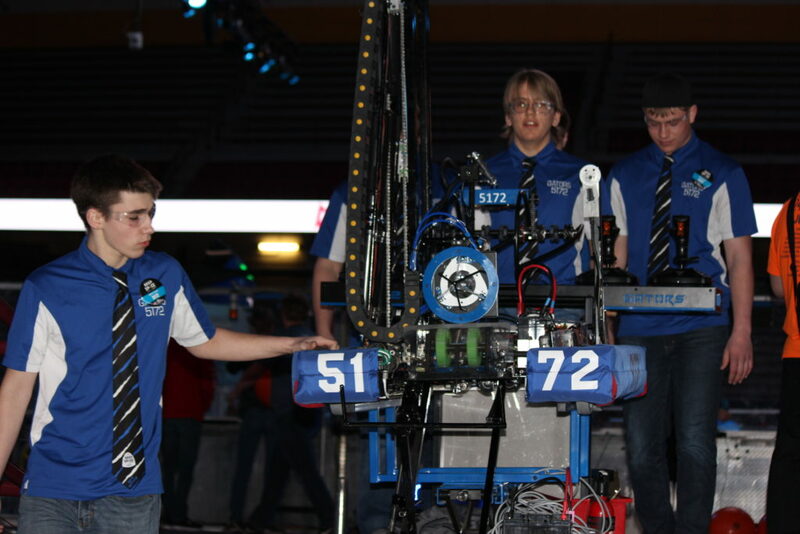 These upcoming matches were looking to be some of the most important matches of our season. 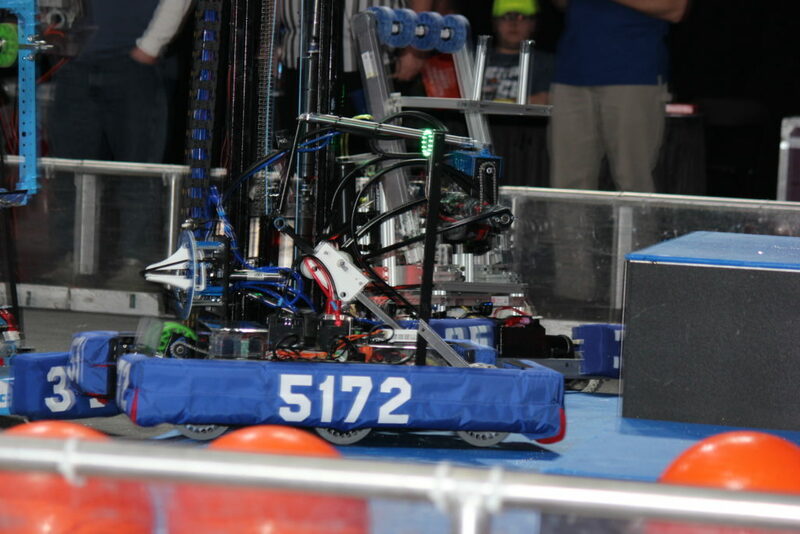 Competing against the 3rd ranked alliance (4607, 3102, 3184), we came out on top with scores of 89-74 and 81-68. 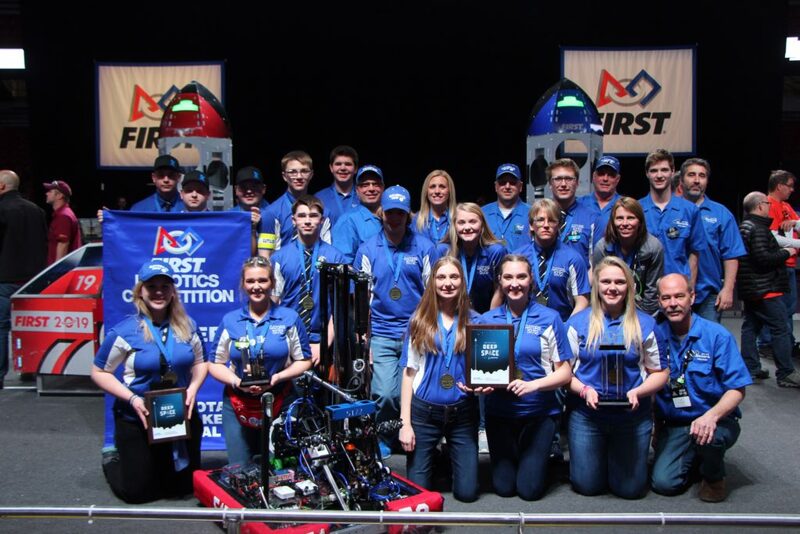 Never in the history of our team had we won both of the regionals of we competed in that season. 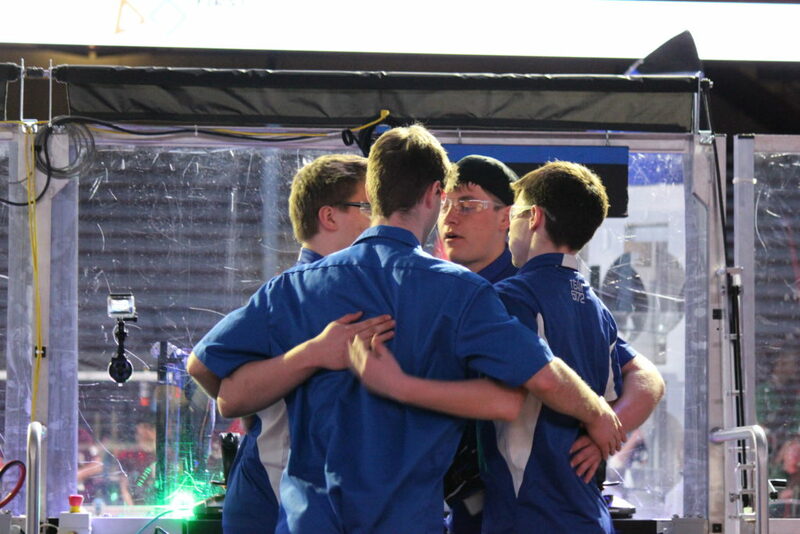 Pride overcame our team as we had accomplished something not too common for FIRST teams. 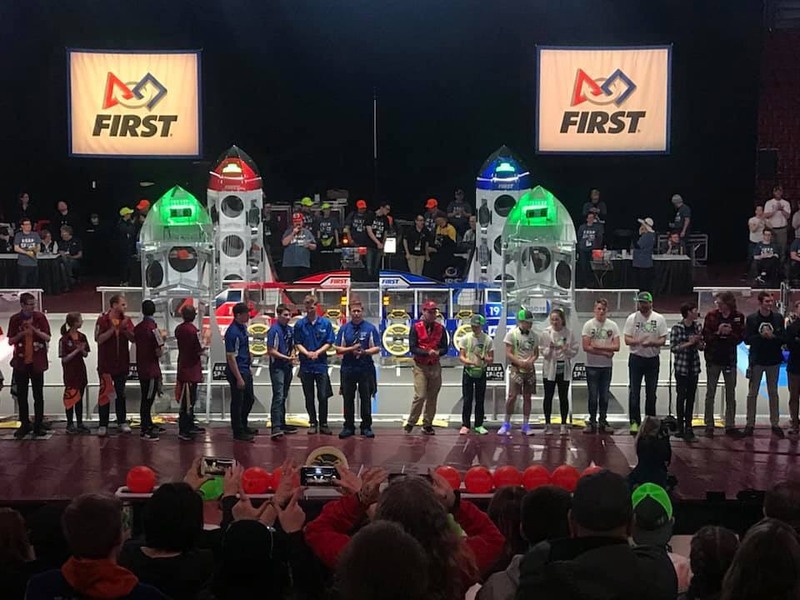 During the awards ceremony, not only were we crowned regional champions, but we were also presented the Industrial Design award by the judges, a robot award that FIRST says “celebrates form and function in an efficiently designed machine that effectively addresses the game challenge”. 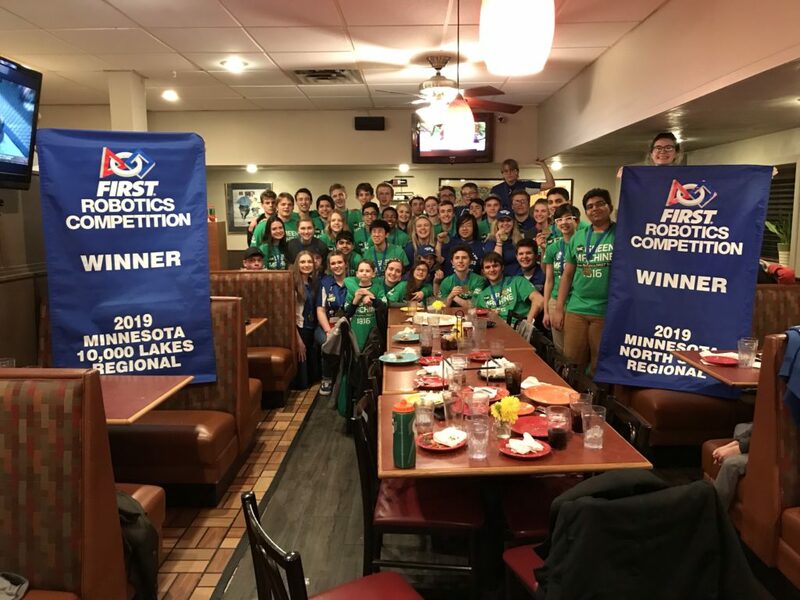 After the awards ceremony, we packed up our pit, said goodbye to alliance members, and headed over to TJs, our favorite pizzeria in Edina. 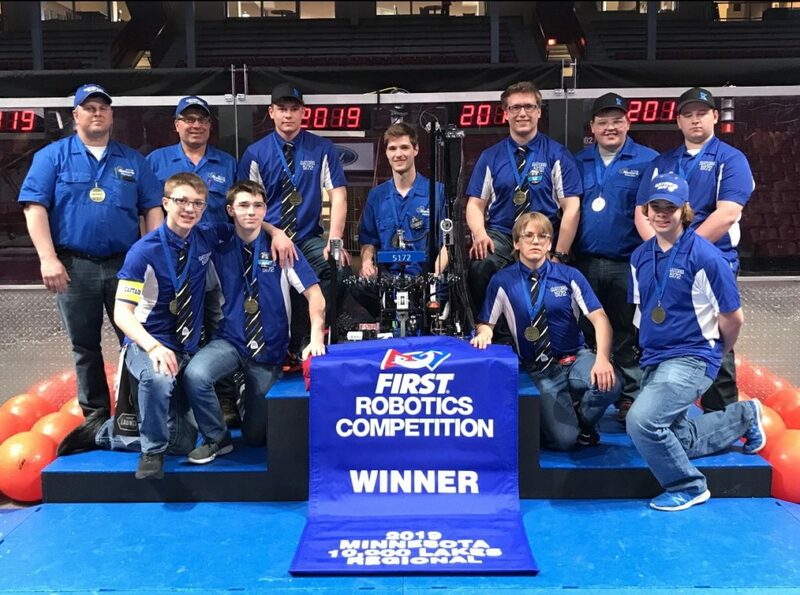 We met our southern sister team, 1816 “The Green Machine”, to celebrate our weekend of successes (they had also won the North Star Regional across the street from us, their first competition win since 2006) and chat over our upcoming trip to the World Championships at the end of April. 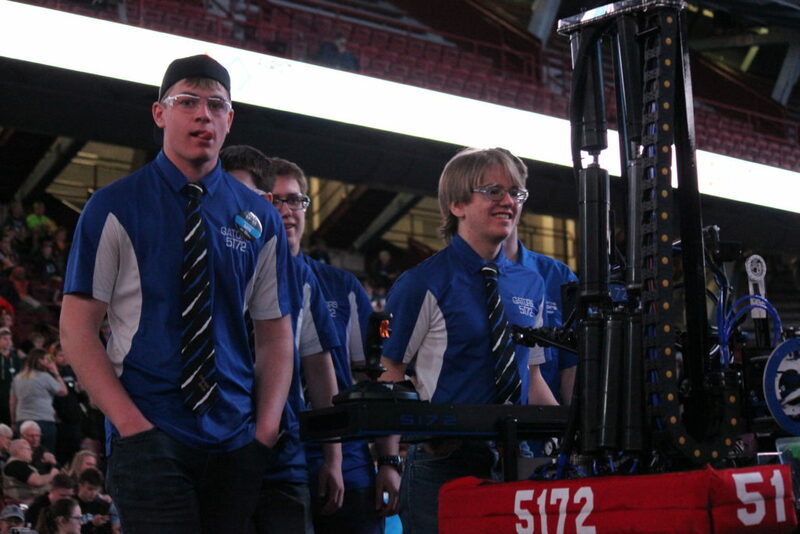 The weekend of thrills and triumphs ended and we headed back to the hotel. 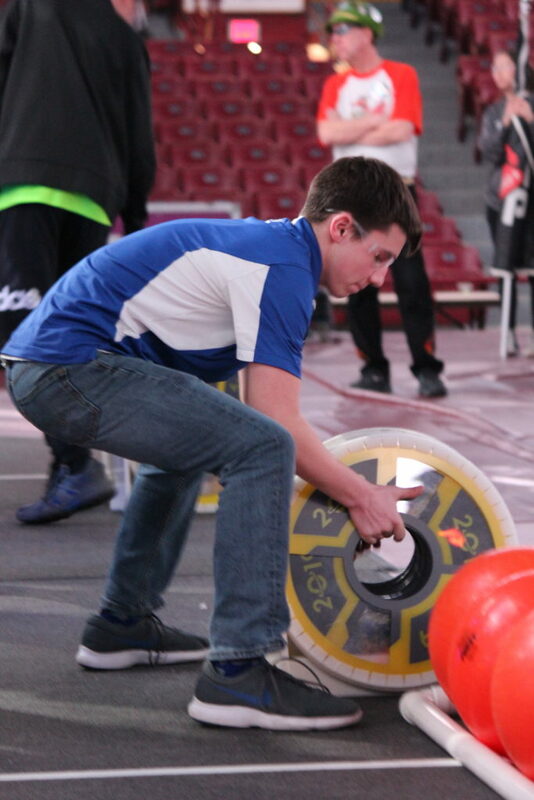 Now to get ready for CHOMPianships in Detroit! 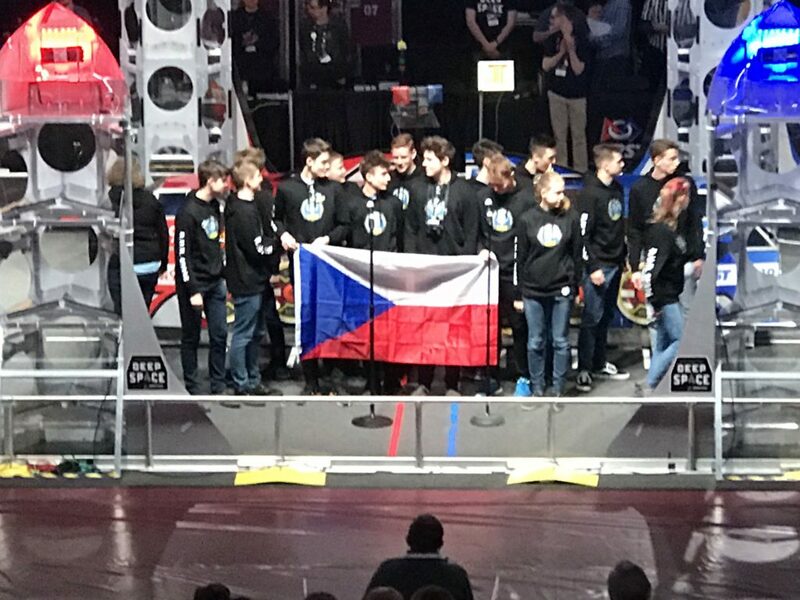 Czech Republic team singing their National Anthem. 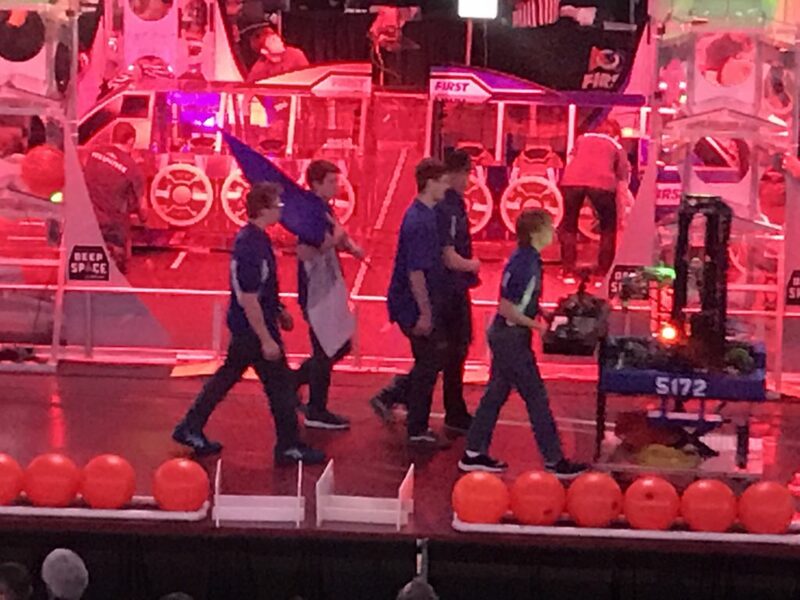 Drive team-going to line up for a match. 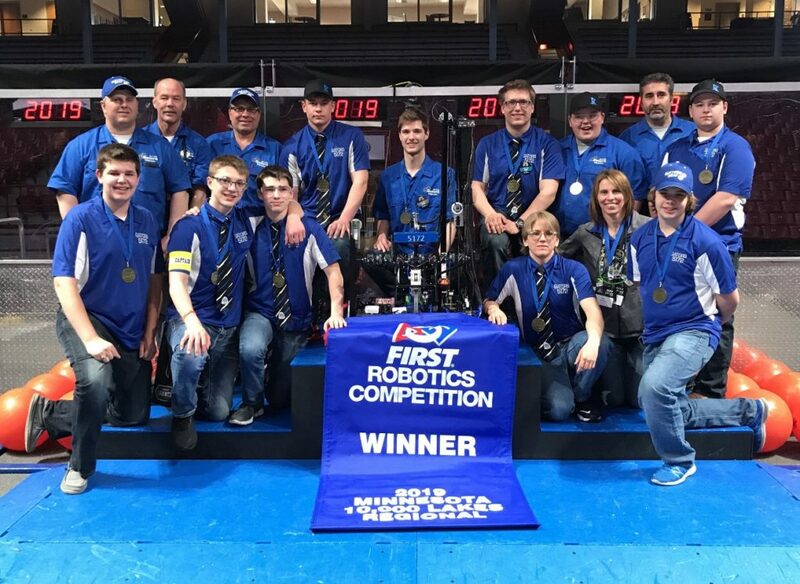 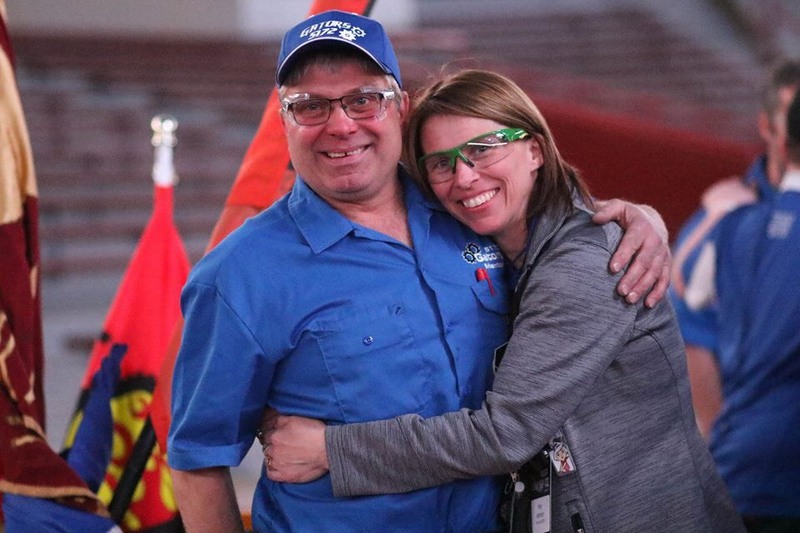 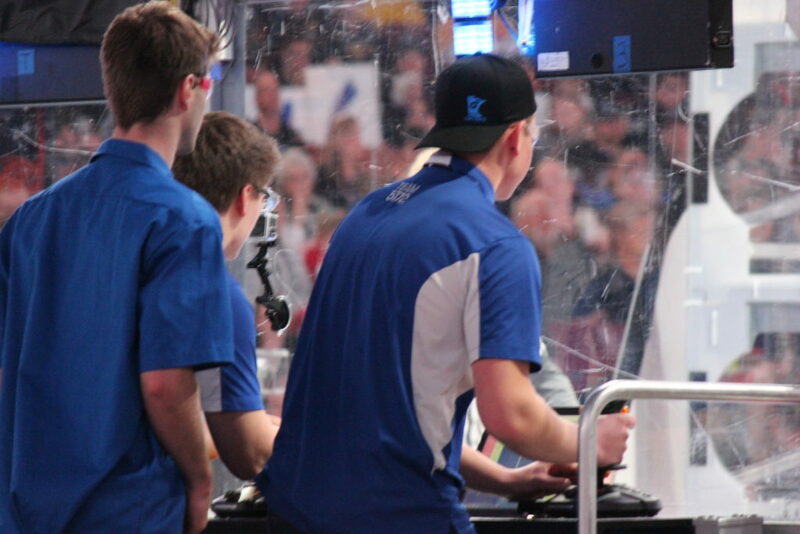 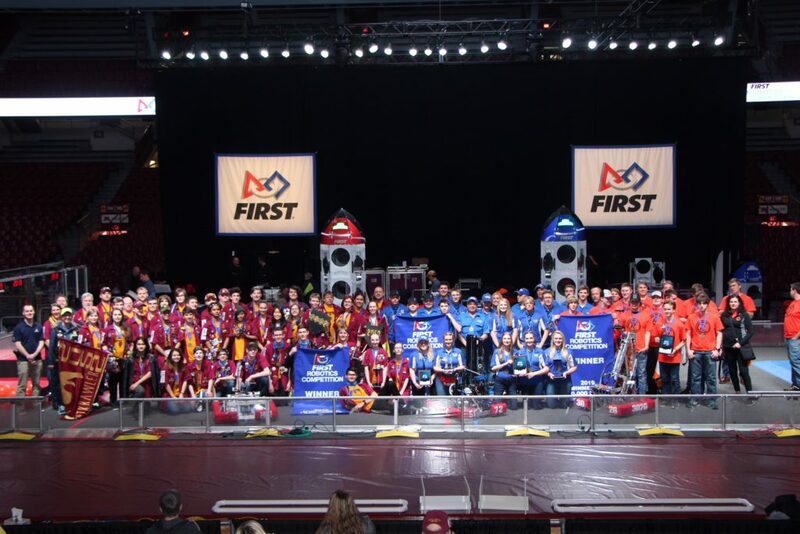 Drive Teams from our winning alliance.